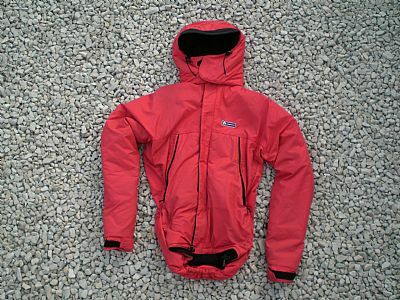 The Montane Extreme Jacket is a heavyweight pile-pertex jacket. In winter this single layer is designed to replace the more traditional system of baselayer, midlayer and shell. For cold snowy days in the UK it works excellently as a single layer garment or with the addition of a thin baselayer and waterproof shell for rain. The singular layer of pertex breathes well and copes with sweat better than most traditional layering systems would be able to (this is because the sweat is drawn straight through the Dryactiv insulation on to the Pertex where it can evaporate from). The cut of the jacket is relatively slim, and unusually for a jacket of this warmth and bulk allows good overhead arm movement with little fabric lift from the hem. In addition, there are elastic pull cords in the pockets that help to reduce the bulk across the ribs. The extra wide Velcro and elastic combination on the cuffs works well to give good adjustment and fit, especially compared to some of the skinny Velcro you see on other jackets. In contrast the Velcro closure on the chin of the hood is a fairly poor design. With the hood down the Velcro chin area provides a good fastening (both panels overlap sufficiently) and makes the hood form a high protective collar around the neck. With the hood up it sits beneath the chin providing very little protection for the face, this is exacerbated when wearing a helmet as the fabric doesn’t fully close around the face. As a result, the hood often undoes itself when turning your head or in high winds can come open of its own accord and in really high winds pull the whole hood off (it is a singular Velcro strip that attaches the hood to the neck). It is possible to alleviate some of these issues (to an extent) by fastidiously making the hood closure as well fastened (matching the Velcro patches millimetre for millimetre) as possible and then tightening the hood to ensure no wind can pull it open and then off. However, on a jacket designed for “extreme” conditions this really isn’t pragmatic with gloves (and/or mitts) on, where simplicity and sensible ergonomics are much more appropriate. The Montane Extreme Jacket is a brilliant single layer piece for cold dry(ish) weather, although massively let down by an ineffective hood closure and attachment method restricting its usability in high winds.